Soothe your baby at bedtime with the serene scene of falling leaves gently swirling above her crib. The Adrift Mora Mobile from Schmitt Design is crafted from FSC-certified cherry veneer and finished with a non-toxic blend of carnauba wax, orange oil and beeswax. The three, thin leaves are first cut by a machine and then refined by hand in a sustainably-minded California design studio. The small perforations let light through and help them to move easily with the air current. 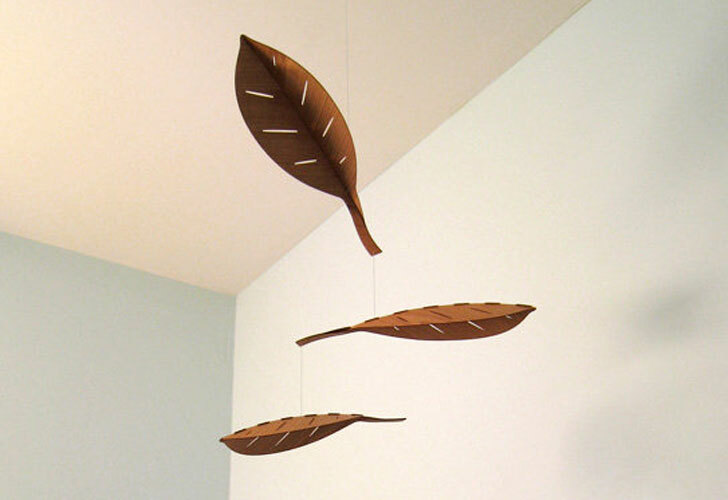 If you’re planning a woodland or nature-themed nursery, this mobile will bring the beauty of the forest inside.